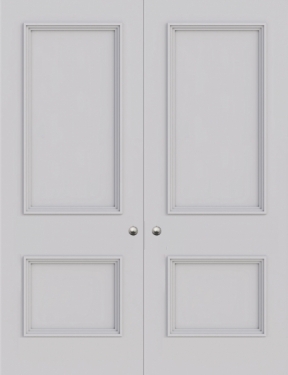 The modern styled FD30 Double Door Newbury is suited to any home, the door benefits from flat panel detail and a raised modern moulding. The Newbury mould is always a popular choice, and blends well to match any new interior. 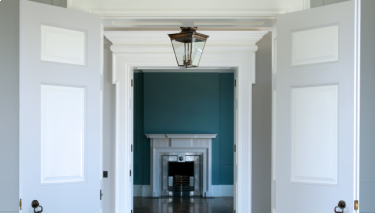 The modern mouldings give a subtle but beautiful look. These moulds suit any space and also are popular choice when replacing doors of bespoke sizes. Every internal door is made from the finest fire resistant materials, we create more than just a beautiful door. The high density engineered board used in the range creates the highest quality fire rated doors that offers 30 minute fire protection. Our team will work to design and create the perfect custom fire door to strict fire regulations. A popular choice in new door openings, and when replacing odd sized doors, these double doors are affordable designer luxury. With the ability to make made to measure doors we can also supply the frame on request. 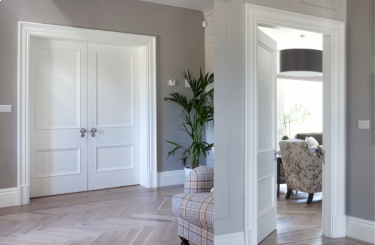 At Trunk we are proud to offer designer bespoke doors, without the hefty price tag. Ironmongery not included, used for visual purposes.